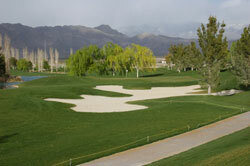 Mountain Falls Golf Club in Pahrump (about 45 miles from the Strip) is a beautifully designed 18-hole championship facility featuring wonderful playing conditions and excellent value. The incredible mountain views from tee to green (and also on the drive along the way), make this a very worthwhile experience. With rates that top out in the $65 price range prime time in 2008 - this is one of the greatest golf values in the region. 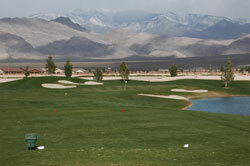 The course works with some local casinos to provide stay and play packages as well (including the Nugget and Saddlewest Hotel/Casinos). 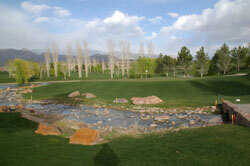 The property at Mountain Falls Golf Club features pro shop plus a well appointed banquet facility that includes a dance floor and provides a stunning setting for wedding ceremonies and special events. There is a full scale restaurant/ lounge in a separate building, plus comprehensive practice facilities including a targeted grass range, short game area with sand bunker, and putting green. Cart attendants greet golfers as they arrive - a sampling of the friendly service that is a trademark of Mountain Falls. Homeowners are afforded special pass promotions for golf and driving range privileges, with single and family rates, and visitor's passes are also available with one, three and 6 month programs for snowbirds. 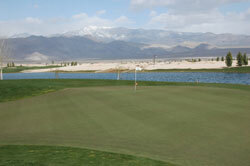 Mountain Falls is a Cal Olson and Nicklaus design, set in a beautiful environment that creates a relaxing, yet challenging experience for all levels of players. 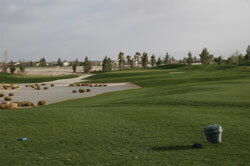 The rolling rye grass fairways and bent grass greens provide excellent playing conditions, and 4 sets of tee boxes on each hole are sculpted out of the parkland/desert terrain. The tees play to distances and slopes measuring 7082 yards/132 slope, 6647 yards/121 slope, 6161 yards/116 slope and 5451 yards with a slope of 122 for women playing from the forward sets. All tee boxes have measurements to the center of the green as do the sprinkler heads on the fairways, and 100, 150 and 200 yard plates are also posted on all par fours and fives. 150 yard rocks are positioned on the sides and small markers on the flagsticks indicate front, middle or back hole locations. Water hazards come into play on 8 holes and approximately 70 soft sand bunkers (including sprawling waste areas) are situated near the landing zones on the manicured fairways or are located greenside. 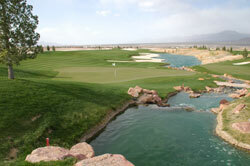 Golfers will encounter spectacular mountain views on every hole, and landscape features include a beautifully sculpted, cascading water fall on the ninth hole. 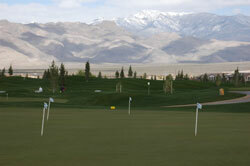 This hazard is situated to the left of the green complex creating the need for an accurate approach. There is generally plentiful landing room off the tee on most holes, and also ample recovery space near the large, undulating putting surfaces. Some of the holes on the back side require an accurate tee shot, with narrow landing zones flanked by waste and sand bunkers plus water hazards. 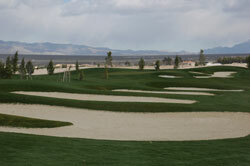 As the slope ratings indicate, this is a challenging round from the championship tees, but golfers playing the blues, whites or reds will be able to enjoy the beautiful desert surroundings as they maneuver the playable layout. The par threes here are a good set, with the 14th being a truly memorable golf hole, featuring a cascading stream that winds around the green. The price is right and we were very impressed with the conditioning and service. There are enough hazards to make it interesting, and top notch amenities continue to grow in this master planned golf community. For more information, visit our page for the course, with direct link to their website by clicking here.